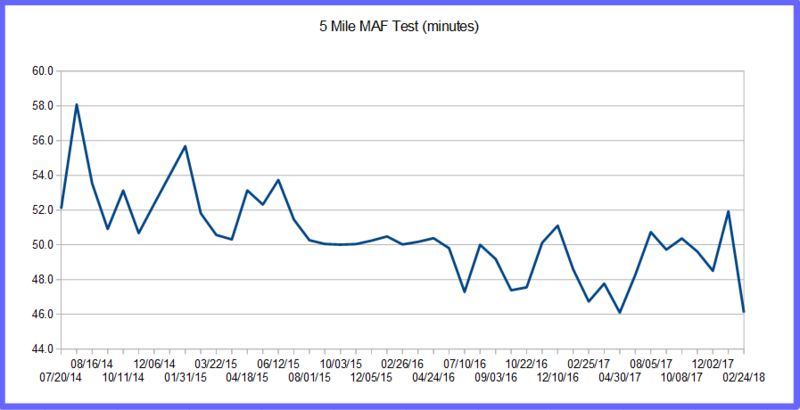 It’s been a while since I’ve mentioned my MAF tests (almost 10 months now). This isn’t because I haven’t been doing them. I’m still heading over to the local high school track every month or so to run five miles at a consistent heart rate (142 bpm). No, I haven’t been documenting them here for the simple reason that they haven’t been very good. I know I should give you the good as well as the bad when it comes to my running, but I find it difficult to go into the gruesome details when I bust out one of these and the results are lacking. And frankly, I’m no expert on running so most times I have no idea why I’m faster one month and then slower the next. Or a lot slower as the case may be. Well, I ended up tying my best time ever (46min6sec) this morning so I figured I might as well document it. For some perspective, here’s a graph of my 45 tests over the past four years. The first year of tests coincides with my second year of running consistently with the high variability a function of me still working on my endurance base. The second year I plateaued and only saw improvements at the very end of the year. The next year I saw some more variability as I trained and recovered from three 100s in a six month period. And last year saw a large improvement early based on Project 14Forty (or so I guess) and then step backs as I recovered from three 100s in four months followed by a 100k and 50M (um, what was I thinking again?). My last test in January wasn’t quite as bad as it looks considering it was only 6 degrees out and very windy. It was 45 degrees outside this morning or just about ideal conditions for the test. I’m going to try and not make too much out of one test though. While I’m confident it gives me a decent idea where I am at physically, it’s not an exact standard given all the variables I’m unable to account for (i.e. nutrition, hydration, etc.). Even though it’s not a 100% accurate test, I’m happy to see that my training is starting to pay off. You go through training cycles and it’s difficult sometimes to know exactly where you are without doing a benchmark race. Lucky for me I have one of those next weekend at the Naked Bavarian 40 Miler. When combined with this morning’s run, I should have an even better idea where I stand heading into my April hundred miler (NJ Ultra 100). Hope your winter/spring training is going well.